I put together a Whimsy jar for Cathy and now I can share it. So glad you love it! I was planning to steal Jenna's digi camera to make something cool for you blog readers out there. But she needs it for a picnic so it looks like that will have to happen via still images instead. My hint has to do with this post. One of the many reasons why I love living in the bay area. Dan got a Wii on Monday and managed to leave it unopened. He didn't mention it until late Wednesday night. I convinced him to set it up tonight. We played so many different Wii sports that my heart was racing at the end. Pathetic? Maybe, but its fun. Wii fit, here I come! Played scrabble with my grandma and beat her by two points. Its been a while since I've played and I worked really hard to win. :) My third time I've beat her, but whose counting? Ohhh so excited for you!!!! I need to go to that tmw! Damn! Im going on sat! POOP! Wii is fun i love bowling. My kids and i play it a lot. Right now we got the x box wii and ps3 here! We are rocking the game systems lol! have a hambly weekend ROFL nice! Can you please take a chip bag with you....I want to make sure if you start hyper ventilating again you're covered. I'm envious of nearly everything about this post...LOL! 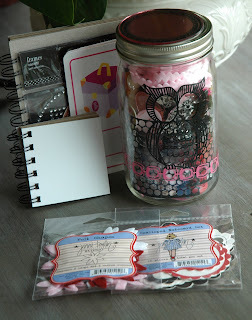 That jar of whimsy has some pretty treasures in it...lucky girl! And, I wish that I could go to that Hambly warehouse gig. Oh, and Wii Fit...I've been wanting one for a while now. We can't find them ANYWHERE around here. Everyone's sold out. Have a fabulous weekend! I looooove our Wii! We just got Mario Kart, and it's pretty much all we do these days!